Built in 2007 by Palmer Johnson, O’Khalila has two complete deck areas plus a raised pilothouse, which blends into an extensive open-air deck. A modern interior by Nuvolari Lenard accommodates 12 guests in six staterooms, and O’Khalila offers blistering performance with triple 3,650hp MTU engines powering her to a cruising speed of 30 knots and a top speed of 34 knots. At more modest speeds she has a range of 4,500 nautical miles. She is a one-owner yacht and has never been chartered. 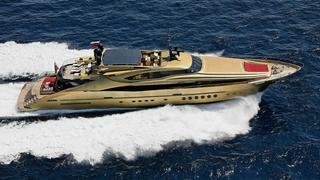 Lying in Imperia, O’Khalila is now down from €10.5 million to €9.5 million.